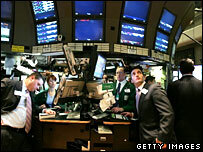 The New York Stock Exchange (NYSE) and Euronext are on the verge of agreeing a merger, reports claim. Euronext is widely believed to want to announce a deal to its shareholders at its annual general meeting on Tuesday this week. Paris-based Euronext is also currently being courted by Germany's Deutsche Bourse, but the two have failed to agree terms despite months of talks. Both Euronext and the NYSE declined to comment on the reports. The Sunday Times said representatives from Euronext and NYSE were agreeing the final terms of a deal which would create the world's biggest global stock exchange with a market value of £11bn. According to the Wall Street Journal, the NYSE is likely to table an all stock offer for the pan-European bourse. The report added that Euronext was likely to prefer the US bid to one tabled by Deutsche Boerse as it would leave Euronext with more autonomy in Europe. Any deal between Euronext and NYSE would leave US exchange Nasdaq with a clear run at the London Stock Exchange. On Friday, the US exchange raised its stake in the LSE to 25.1%. Nasdaq has been steadily increasing its stake in the London market, since the LSE rejected a £2.43bn takeover offer. Experts have suggested the strategy allows Nasdaq to keep its options open, while also putting it in a better position than any prospective rivals should it decide to launch another bid for the London market. According to reports earlier this year, both the NYSE and Euronext had planned an approach for the LSE. Desires to cut costs, attract more company listings and increase trading volume have increased interest in possible mergers between exchanges across the globe.